During his Inauguration Homily, our Holy Father the Pope Emeritus Benedict XVI asked for prayer that he might not "flee for fear of the Wolves". Now, very usefully, the unspeakable Daneels has blurted out information about how the Wolves described themselves: they were "the St Gallen Group". Their declared purpose was to oppose the mission of Pope Benedict to reconnect the Catholic Church with Tradition. Apparently these lupi see no disgrace in likening themselves to the Mafia. Or is it only after the end of a pontificate that the brave souls who have conspired against the Pontiff have the courage to rubbish him publicly? During his pontificate, did they proclaim their loyalty to him from the housetops? While putting in the boot behind closed doors? And then boasting noisily about their doings as soon as he was gone? Is that how the Church is supposed to operate? I'm uncertain whether to call this 'group' a latrocinium or a lupanar. What a seedy gang of hypocritical crooks at the very heart of the Church, plotting ... even as I write this and you read it ... to corrupt the imminent Synod of Bishops. A final question. The "Team Bergoglio" that we read about a year or two ago ... does that group have any overlap with the "St Gallen Group"? Thank-you Father. Beautifully articulated. We live in a time of spiritual horror. Response to the final question: that's one of those self answering questions. This group (which has the gall to besmirch the name of the saint who evangelized some of their homelands) seems like a vile parody of the groups of brave souls who met in secret in preparation to return fully to the bosom of Holy Mother Church in the days leading up to Anglicanorum Coetibus. A quite rational 'fear of the wolves' in the light of what we now know about the Carafa faction, who having installed him as Paul 1V were unable to trap Reginald Pole, beyond their reach in England, whilst Cardinal Morone languished in prison? Pope Emiritus Benedict is undoubtedly free to travel and reside wherever he wishes, as of course nothing of that sort could possibly happen now, as, thank goodness, Pope Francis has assured us that he is not a Renaissance prince. Thank you Father Hunwicke, greatly enjoy your blog. God Bless. When Pope Benedict's helicopter taking him away was rising in the sky above St.Peters I was overcome with an indescribable sadness. Benedict was always for me the main man. It was only later with the advent of Pope Francis that I understood why my sadness had been so profound. The passage from Ezekiel 10:18 explained everything for me. The Wolves are intent on tearing out our hearts and devouring us piecemeal at the coming synod. Absolute carnage. However, the words of our lord will comnfort and sustain us ... Fear not, little flock. Hmm....Chappy B+, even when the Beloved Bride of Christ is under assault from heretics and apostates in the very highest authority? Interesting. I think we shall see more clearly in the fast approaching Synod on the Family. I do think eventually all will be CRYSTAL clear. Had Pope Emeritus Benedict XVI not resigned (in part) the length and breadth of the corruption in the Church would not have been exposed to the light of day so that the faithful might know and choose for Christ or against Him. As for the liciety of the conclave and election which subsequently produced Bergolio, I can only recall the words of Sister Lucia of Fatima who, in describing the vision Our Lady had shown to the three little seers, recounted a bishop in white who gave the 'impression' of being the Holy Father. An 'impression' is a peculiar choice of words. You sound a bit cross Fr Hunwicke. For what it's worth, I am as well. It was apparent that HH Pope Benedict was being undermined and shafted from within the highest reaches of the Church - and now they have the gall and brass neck to boast about it! I sincerely hope the revelations stiffen the resolve of those who see the importance of the core teachings of the Church, as well as those clearly committed to upholding them. Mark Waulk to the contrary, the question which you raised at the end of your essay is not self-answering. 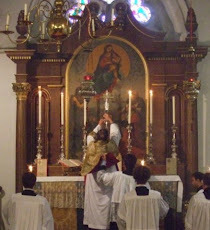 For my part, while latrocinium has its merits, as it is near to the speluncam latronum spoken of by our Lord in Matthew and Luke (at least, in the Vulgate), considering the willingness of the participants to sell themselves for the sake of their 'pot of message', as well as the likely sexual preferences of the participants, I would settle instead for Lupanar. Let the discerning take note. Last year, when I wrote the same in a comment here, I was censured. You said: " Last year, when I wrote the same in a comment here, I was censured." I can only observe that certain wines are best for fish while others for fowl. Re: "impression," this is a term of art that gets used in a lot of saint stories. For example, the soon-to-be St. Zelie Guerin Martin had two experiences of hearing the Virgin Mary tell her things. The earlier published accounts by her daughter Celine just talk about "a voice," and later on, you find out that Zelie had all the time had the impression that it was Mary's voice, and that Celine knew it. But nobody - not her, not her daughter - was going to say straight out that she heard a locution from Mary, because that's not how it is supposed to be said until the investigations are done. It's presumptuous. Likewise, Lucia and her friends had gotten a lot of lectures about presumptuousness, and she wasn't going to say straight out that she saw a future pope. But why research? Any stick will serve to beat on any current donkey. "My impression is that the Rosary is of greatest value not only according to the words of Our Lady at Fatima, but according to the effects of the Rosary one sees throughout history. My impression is that Our Lady wanted to give ordinary people, who might not know how to pray, this simple method of getting closer to God." The interesting bit is that a lot of the sketchier contemporary "visionaries" have picked up on this word (as Google reveals), and like to say that they have an impression of this or that from their visions. I wonder what the word actually is, in Portuguese.